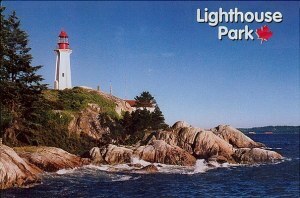 Lighthouse Park is a popular park in West Vancouver, Canada. Its area is about 75 hectares (185 acres) and it is almost completely covered with rugged, virgin rainforest. At the southermost tip of the peninsula is Point Atkinson with an impressive landmark lighthouse built in 1914 on granite boulders jutting out into Burrard Inlet. Point Atkinson was first charted and named by CaptainGeorge Vancouver in 1792 and is a National Historic Site of Canada. The Point Atkinson Lighthouse is the location of Starboat Cove, which may be reached by hiking the Valley Trail in this park.